This Sunday, millions of Americans will settle down in front of the TV to watch the biggest football game of the year. The National Chicken Council, a chicken industry trade association, estimates that while the country’s football fans cheer on their favorite team, they will also consume about 1.3 billion chicken wings. We take our game day snacks seriously—so why not take a minute to seriously consider the lives of the chickens raised to produce those wings? Most chickens raised for meat in the U.S. are suffering on inhumane, unsanitary factory farms. Tens of thousands of birds are kept together in huge sheds, growing at such crippling, unnatural speeds that much of their short lives are spent lying on the floor in their own waste. Chickens raised on factory farms often have open wounds, which can act as gateways for bacteria like Salmonella. All three of these certification programs regularly visit farms to ensure that animals are raised according to higher welfare standards that span from birth to slaughter. For example, they prohibit the use of antibiotics for growth promotion, set minimum standards for space per chicken, and require enriched environments that allow the chickens to carry out their natural behaviors like dust-bathing and scratching. 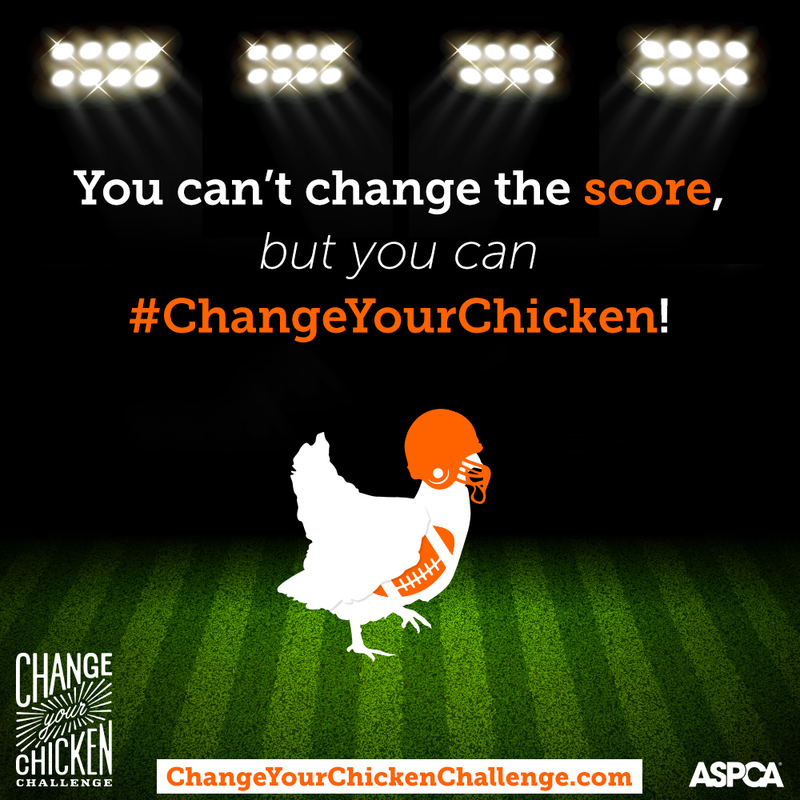 The Change Your Chicken Challenge website has links to resources and online search engines that can help you find higher-welfare-certified products where you live; it also offers a downloadable supermarket request card for asking your local supermarket to carry more welfare-certified products. Additionally, you can check out Buying Poultry, an online resource designed to help you find higher-welfare-certified products near you. Kick off a commitment to better lives for farm animals—sign up to take the ASPCA’s Change Your Chicken challenge today.